The Program for Severely Orthopedically Impaired (SOI) serves students through the Southern Oregon ESD Regional Program in Jackson, Klamath, Josephine, Douglas, and Lake Counties. SOI also serves non-regionally eligible students through district contract (choice and equity) for Jackson, Josephine, and Klamath Counties. The physical therapists (PTs) and occupational therapists (OTs) work with staff and parents of students from birth to 21 years to ensure student access to instruction in their school and local community setting. Physical therapists focus on postural and gross motor functioning. Gross motor includes head control, sitting, standing, wheelchair use and walking. Occupational therapists address fine motor skills such as reaching and grasping, manipulation of materials, and coordination of two-handed activities. Both disciplines may also work with staff and students on sensory motor skills. Service delivery can be direct instruction to students. For example, students may need to learn how to use adaptive equipment in their classroom setting. The adaptive equipment can facilitate a student’s ability to interact with their peers and participate more fully in classroom activities. Therapists may procure the equipment and teach the student to use it at home and school. Oftentimes, students with physical challenges are instructed in self-management and self-advocacy skills to help them reach greater levels of independence. Physical and occupational therapy services are also delivered through a consultation model whereby a therapist will work with parents and school staff. PTs and OTs work with adults in a student’s life to develop a program that focuses on the student’s safety, personal care, access to instruction, computer access, and other areas of need. An important goal of therapeutic intervention is to help students meet challenges and become an active and contributing member of the community. Physical and occupational therapists do not have a regular daily routine. Their schedules are in constant flux depending on the need of their students and the staff in the individual classrooms. They attend and contribute to the development of IFSP/IEPs. They consult with and train classroom staff and parents to deliver ongoing therapy. They repair, fit, purchase and construct equipment for student access and safety. They train staff, students and parents to modify the student’s environment. Other areas such as mobility, safety, safe feeding, and positioning are also addressed through IEP meetings and consultation. Physical and occupational therapists help adults in the student’s life understand the impact of the orthopedic disability. Physical and occupational therapists work to make modifications for students fun and functional. 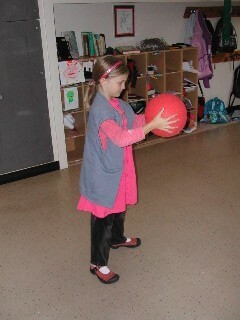 Several students need to work on stretching, range of motion, and fine motor development. Occupational Therapist, Karen King, looked for a creative way to get the students to work on their own motor development. Karen requested the purchase of an Aquadoodle for students at Little Butte Elementary. The Aquadoodle is a 32 x 32 inch mat that students can stamp or draw on using pen-like holders filled with water. The mat is placed on the floor. Students are positioned to sit at the mat to draw. In the past, an OT may have physically manipulated the students’ hands and arms. With a toy such as the Aquadoodle mat, the students can meet the same goal while they simultaneously work on a range of motion goal. This creative and innovative approach provides training in an important curriculum area, and as Karen put it best, "Why not have fun while working on IEP goals?"